Normally end of February, beginning of March there are what they called the “mangos’ rains”. It is a couple of rain which come at the beginning of the mango season, cleaning them form their dust. Adults say to youngster that mangos are not good before the “mangos’ rains”. Since they do not wash them before eating them it prevents them to get diseases coming with the dirt on the mango. This is so much imbedded in the mind of the people here that even adults who sees mangos along the road will tell you they have not a good taste because the rains have not come. Mango tree in our house in Bobo. The following story has nothing to do with a fairytale. Since almost a year, the value of the donkey in Burkina has been going up. Reason: Chinese are buying the skin of the donkey and shipping them to Hong Kong!!! A donkey would never cost more than 60 euros it is now going over 100 euros. There are more than 1.300.000 donkeys in Burkina, but they estimate that 30.000 skins were exported in 2015. Local people starts to worry. 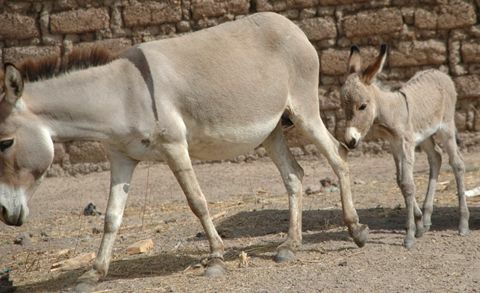 It takes between 350 and 450 days of gestation for a female donkey and she has to wait 2 years between pregnancy. Due to this traffic, a lot of clandestine slaughterhouses have been opening. The authorities have a problem, there is no law prohibiting export of the donkey skins. They have tried to slow down the traffic looking at the health aspects. Skins can carry diseases. But it seems that the Chinese authorities are not worried about this…. What is happening in Burkina is probably also happening in the neighboring countries. This comes at a time when the donkeys are slowing being replaced by tricycles mainly in town but also in villages. Bad time for the donkeys. Last Wednesday night it was time to harvest the hives we have at the LAP. We took this opportunity to train farmers who recently got hives from us on the harvesting process. Macaire (red hat) giving the instruction to the farmers. The group harvested for 5 hours (it is very hot in the special suit). The harvest was good, about 85kg of honey and wax from 13 hives. I did not wear a suit and after being stung by a bee I decided to stop taking pictures. Since there are still a lot of flowers on the trees due to late season, we will be able to harvest a bit more honey at the following full moon. Chaque matin, en Afrique, une gazelle se réveille. Elle sait qu’elle doit courir plus vite que le plus rapide des lions ou elle sera tuée. Chaque matin, un lion se réveille. Il sait qu’il doit courir plus vite que la gazelle la plus lente ou il va mourir de faim. Cela n’a pas d’importance si vous êtes un lion ou une gazelle. Lorsque le soleil se lève, il vaut mieux commencer à courir. Only one more week for this trip.